Our loyal visitors will already have noticed we've made some slight changes to the website. 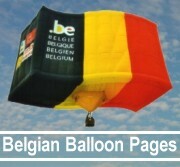 When you enter the site you can see new pictures of the gasballoon pilots. At this moment we have the photo of over 150 pilots. At the bottom of each photo you can also find the pilot's nationality.